Thursday night at the A. O. Shirley Grounds the BVI Football Association held the finals of the BDO Schools Football League. 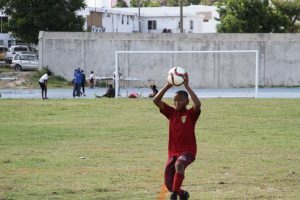 In the under seven division Bregado Flax defeated a talented Williard Wheatley team by a final score of 1-0. It was Shomari Lennard who got an early goal in the 6th minute of play which proved to be the only goal of the game despite both teams getting good looks during the game. Shomari Lennard in fact went on to be awarded the golden boots of the league having dominated the division with over 20 goals this season. 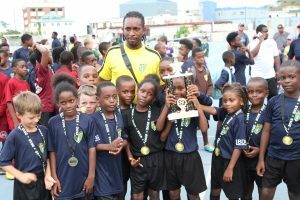 With the early success of his U7squad coach Albert Thomas was back again with the hope of a repeating performance with his very confident U9 squad who were yet to be defeated in the league . 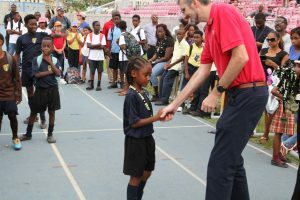 It came to no surprise to the coach and the players when Kyle Farrington found the back of the net with an impressive right footer from 20 yards out in just the 3rd minute of the game to make the score 1-0 to the visitors from Virgin Gorda. It took the mighty Althea Scatliffe six minutes after looking a bit shaky at the start to respond as the talented Tiondre Frett blasted an amazing 30-footer with great power and accuracy to equalize the game at 1-1 in the 12th minute, despite the keeper getting his hand to the ball. Tiondre Frett was not finished yet and six minutes later in the 18th minute blasted another 30-footer and this time the keeper didn’t even have time to move as the ball clammed into the back of the net for a 1-2 lead. Bregado Flax fought hard to get back into the game but struggled to get past the midfield players of Althea Scatliffe since coach Montgomery Butler realizing the talent of Tiondre Frett actually put him to play in the midfield and not in a striking position which probably explains why both of his goals were scored from midfield range and not from a striking position. Penalty Kicks decide the U12 Finals between Cedar and VG. The only thing missing from the finals at this point was a bit of drama and this void was filled when Cedar School came up against Bregado Flax in the U12 division finals. Bregado Flax attacked the goal well but great goalkeeping with a few spectacular saves kept the guys from across the waters abay. At the end of regular time it was the dreaded penalties which was to decide the fate of these two schools. Bregado Flax took the fist penalty and scored as goalkeeper Jaden Abrams was able to beat his counter part with a hard high shot to the left V of the goal and give the visitors a 1-0 lead. It was not until the talented Ryan Lettsome came up to the spot as the number three kicker that Cedar was able to tie the score at 1-1. No one else was able to find the back of the net until Cedar’s Dilan Cline drove a right footer to the low right of the keeper, hit his hand, then the goal post before going into the back of the net for a final score of 1-2 in favour of Cedar International School. 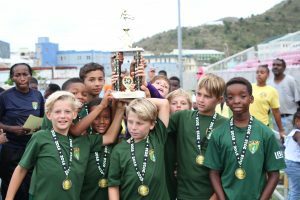 Despite all the challenges of 2017 the BVIFA did a grand job in getting 34 teams to participate in the 2018 schools league and Bregado Flax along with coach Albert Thomas were able to field teams in all three games of this year’s BDO Schools finals. The FA expects to double their numbers in October when the next league is due to commence.